The seventh annual Bible Exhibition - Expo-Bible - will take place this summer in the seaside town of Houlgate in Normandy, north-western France. The exhibition will be open to the public for a period of two weeks from Wednesday, August 6th through to Wednesday, August 20th. The Bible Exhibition is a marvellous way to reach out to French people and to other nationalities also in a way that is culturally acceptable and also very effective. In addition to the many French visitors, we have had visitors from the UK, the USA, Holland, Germany, South America, the Far East, the Middle East - and many more places besides. The exhibition takes visitors through the Bible, its history, its message and its contents. At the heart of the exhibition is the message of the Gospel, of the work of the Lord Jesus Christ on the cross to save sinners. It concludes with testimonies from those who have found new life in Christ, and recommendations that visitors should read the Bible for themselves in order to find out more about it and its contents and particularly about the one to whom the Bible points: the Lord Jesus Christ. In addition to the nearly forty exhibition panels, there is also a display of Bibles in many different languages and from many periods of history. There are various display stands that offer visitors the chance to choose their own free leaflets and Gospels. 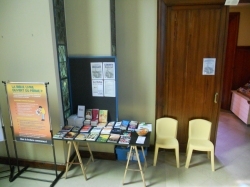 There is also a book stall where visitors can buy from a range of Bibles and Christian books. One version of the Bible that we have available is described as "A Bible for the price of a cup of coffee" and it costs €1.50, which is about £1.25. There are also opportunities for team members to talk with visitors, to answer their questions, to explain aspects of the Christian faith, and to share their testimony. 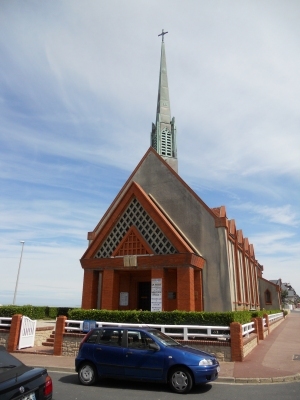 In addition to the exhibition itself, Normandy Vision in co-operation with the Eglise Evangélique d'Houlgate - Houlgate Evangelical Church - organise Sunday morning worship services in English for holiday-makers and tourists whose first or second language is English and who do not understand French sufficiently well to be able to attend the church's regular services on a Sunday morning. Find out more about the English-language worship services. During Expo-2014 we hope to have Pastor Ryan Powell and his family with us for part of the time. Ryan is an American missionary with TEAM (The Evangelical Alliance Mission) currently based in Versailles. He has come to France to be involved in a Church planting ministry. He will be speaking at various meetings and events during his time at Expo-2014, talking about the Bible, the gospel, the Christian faith and the Lord Jesus Christ. We are also trying, as we have done in previous years, to organise other events and ministry to supplement the exhibition itself. More information on these events will be announced in due course. 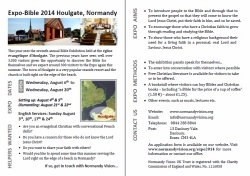 The team will be on site at Houlgate from Saturday, August 2nd through to Monday, August 25th. 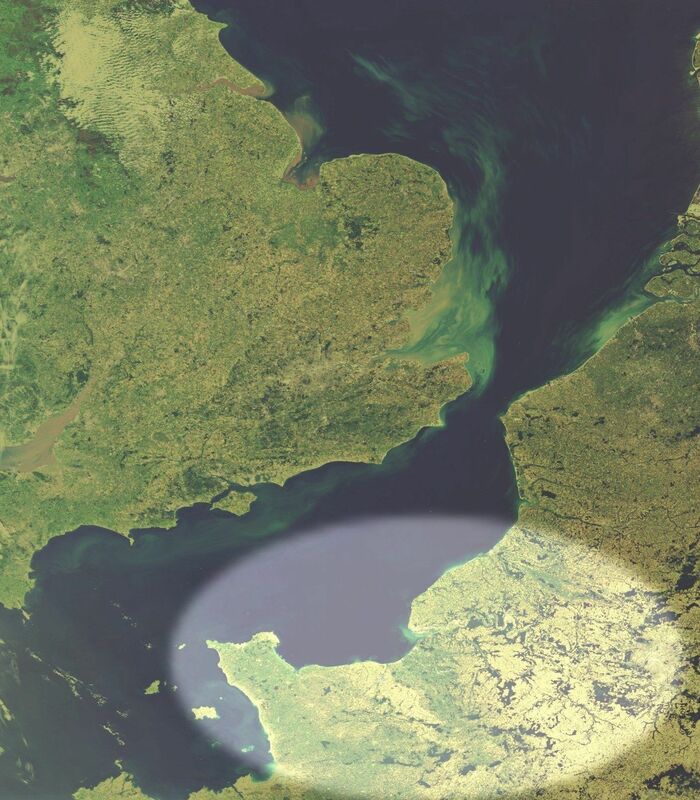 Note, that as Monday, August 25th is a Bank Holiday in the UK, you may prefer to travel on the Tuesday, If this is the case, please contact Normandy Vision before making any arrangements to see if this is possible. English-language Sunday morning worship services: August 3rd, 10th, 17th, 24th. Dismantling of the exhibition: Thursday, August 21st and Friday, August 22nd. A leaflet is available that gives more information about the Expo and about helping at it. View a copy of the leaflet in PDF format. If you would like to volunteer to help at this summer's Expo-Bible in Houlgate then please visit our Expo-2014 Helpers page where you will find more information. If you think that you are able to offer to help, please get in touch with Normandy Vision as soon as possible. 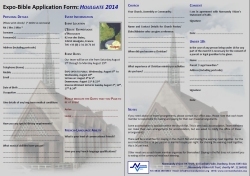 Show the Application Form for helpers at the Expo-Bible online in PDF format.